NETWORK UPDATE: The STANLEY CUP FINALS adjusted up by 0.2 to a final 1.7. FOX’s MAJOR LEAGUE BASEBALL coverage stayed at 0.5. 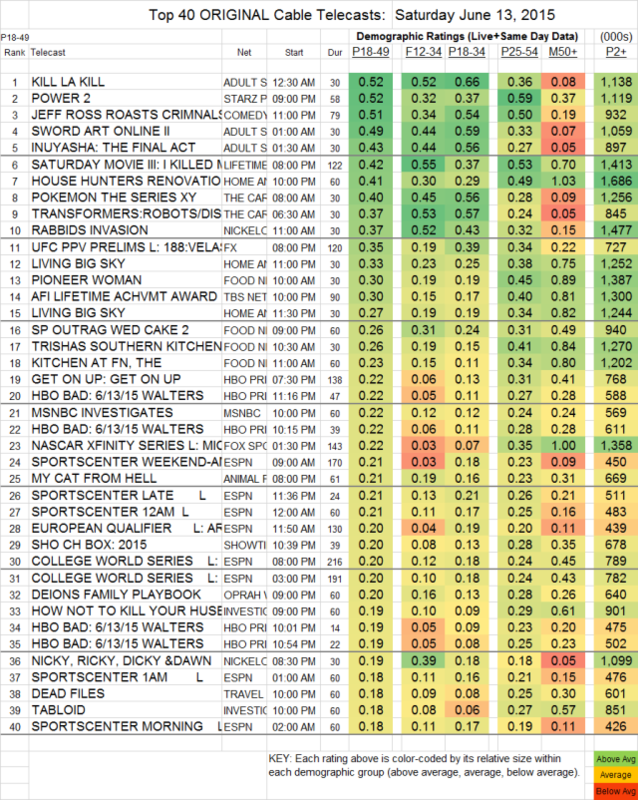 CABLE HIGHLIGHTS: The Saturday night cable winner isn’t actually on the chart below, because Adult Swim’s DRAGON BALL Z is technically a rerun, although the current versions of the episodes haven’t been shown in the US before. It was at 0.64, up 0.02 from last week. The rest of the Adult Swim late-night block was strong as well, with KILL LA KILL down 0.04 to 0.52, SWORD ART ONLINE up 0.05 to 0.49, and INUYASHA THE FINAL ACT down 0.02 to 0.43. POWER (Starz) has already been renewed for its 3rd season, and no wonder, as the 2d episode of Season 2 was at 0.52, down 0.09 from the season premiere. The Comedy Central special JEFF ROSS ROASTS CRIMINALS was at 0.51. Lifetime’s original movie was at 0.42. HGTV’s HOUSE HUNTERS RENOVATION was at 0.41. The other 3 slots in the Top 10 went to morning cartoons, with Cartoon Network’s POKEMON at 0.40 (up 0.03) and its TRANSFORMERS at 0.37 (up 0.02), and NICKELODEON’s RABBIDS INVASION also at 0.37 (up 0.02). TBS’s airing of the AFI LIFETIME ACHIEVEMENT AWARD special (the awardee was Steve Martin) was at 0.30. The day’s highest-rated sports event was FX’s UFC PPV PRELIMINARIES at 0.35, and HBO’s BOXING AFTER DARK was at 0.19-0.22 over its various segments. On BBCAmerica, ORPHAN BLACK fell 0.05 to 0.11, and the premiere of JONATHAN STRANGE AND MR. NORELL was at 0.07 in 18-49s, with 342K total viewers.